This entry was posted on July 20, 2010 at 11:22 pm and is filed under KOffice, KPresenter. You can follow any responses to this entry through the RSS 2.0 feed. You can skip to the end and leave a response. Pinging is currently not allowed. 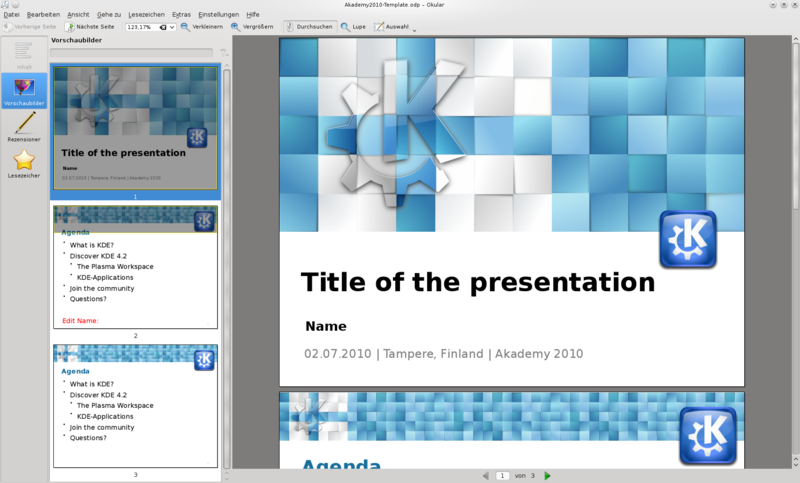 Otp is the OpenDocument Presentation Template type; that is supported by KPresenter. I also know that at least pps (PowerPoint Slideshow) is supported as well by ppt filter. Perhaps you could add that to the filetypes supported? And there is presumably also some ppsx or similar for the msooxml filters. ODS isn’t really suited for this as the sheet isn’t page based. Of course ODT would be cool to. I’m not sure how to do that yet though. That what I call fantastic! ODS isn’t really suited for this as the sheet isn’t page based. Would it be possible to just have one really long page, or to break it up into pages based on sort of rules? For instance you could use one of the font sizes set system-wide by KDE to set the width and then use the aspect ratio of the preferred page size to set the height. I think turning okular into as generic a document viewer for all your document needs would be a huge boost. Great news! But I hope .odt will be also be supported sometimes. Nice, only 107 lines is pretty small code! I hope packagers pick this up. This is really good news. I hope to view presentations in Okular in a near future. 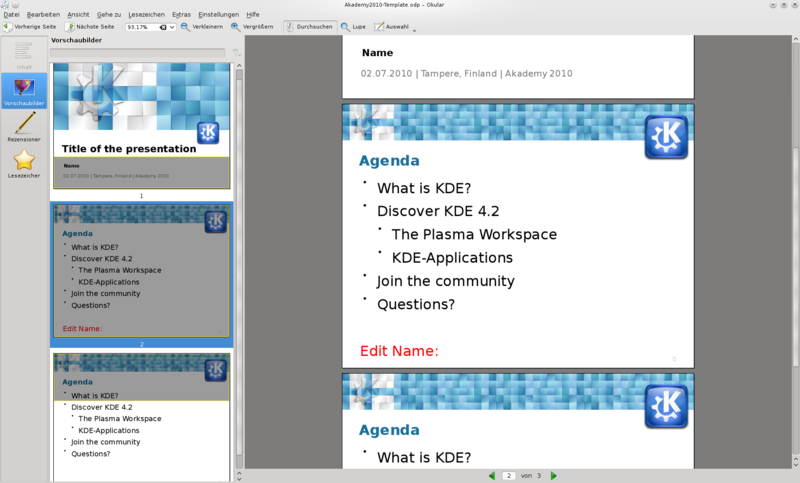 Are you familiar with the internals of the text based KOffice libraries? There is a QTextDocument based generator in Okular which just takes a QTextDocument and does all the rest automatically. So if you know whether it is possible to get a QTextDocument for a ODT, then implementing proper ODT support in Okular should be quite easy as well. It’s a bit more complicated than that. Of course I want all of the document and not just the text. QTextDocument is used internally to store the text, but the rendering is done but KOffice code. I’m trying to come up with something, but it’s more complicated than the presentation case. Wow! great feature. I think ODF support will make viewing documents and presentations more easy.